[INQ. NO. 1610E05] “WINGCLASS,” the new brand exclusively dedicated to peripheral devices, has a product range under development including smartphone cases, Bluetooth speakers and ear sets that is targeting the market segment on the basis of lifestyle. DAO has announced the new products at the Mobile & Wireless China Sourcing Fair, 2015 in Hong Kong prior to the official products’ launching scheduled some time during the first half of this year in order to penetrate into the global market. DAO is planning to have the new products of WINGCLASS presented not just in domestic exhibitions but in international exhibitions including the Hong Kong Electronics Show, after the successful exhibition in the Mobile & Wireless China Sourcing Fair, 2015 so as to constantly target the global market. WINGCLASS keeps creating new values under the slogan “feel the new wave,” and excellent design & rational planning will be the new starting point to provide customers with joy of possession and use at the same time with humanoriented products that customers all over the country can use easily and conveniently. DAO rediscovers existing things in our daily lives and converts them into new values. DAO is not just pursuing customers’ satisfaction as to products but true “High Quality of Life’ that changes customers’ lifestyles by rediscovering everyday life, which is the brand philosophy of WINGCLASS. 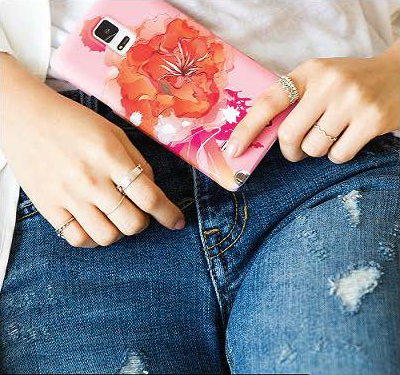 DAO’s flagship smartphone case under the new brand name of WINGCLASS adopted various types of manufacturing processes with unique designs, patterns and feel. Dozens of products have been developed by these various kind of processes including 3D sublimation transfer, handicraft emboss, diamond cutting bumper and so forth. The one manufactured by the 3D sublimation among them had the design and production done locally and those being exported to the global market are also locally produced. Products developed by the 3D sublimation were presented at CEBIT in Hannover last March and a great deal of pre-orders resulted there.